Low-maintenance lilacs provide beautiful spring blooms and fragrance, followed by bushy growth throughout the summer. Lilacs come in hundreds of varieties, from the dwarf lilac to the Japanese tree lilac, allowing gardeners to find the perfect variety for their gardening situation. 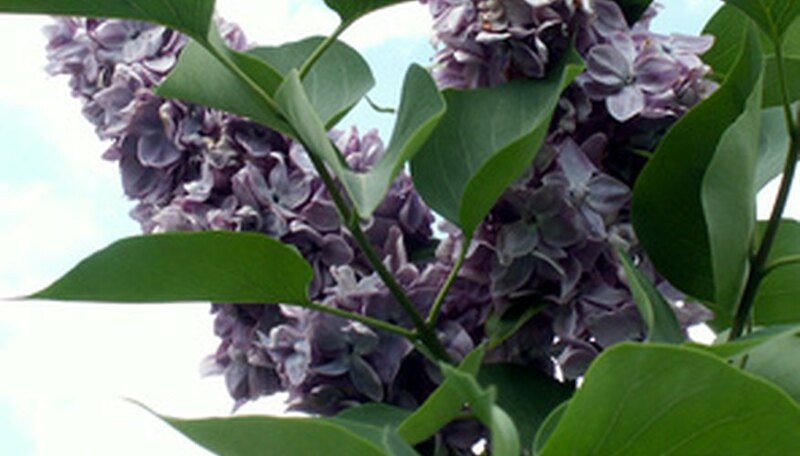 Experiment with lilac varieties, including lilac trees, shrubs and bushes in your landscape. Japanese tree lilac (Syringa reticulata) is a single or multistemmed tree that grows 18 to 25 feet high. The tree has spikes of white flowers in late spring and bronze foliage in the fall. Japanese tree lilac has a bushy growth pattern, with low-lying branches. The tree is ideal for sunny, dry locations. Additionally, common lilac (Syringa vulgaris) is generally grown as a shrub, but can be pruned to one central trunk to grow as a tree. This old-fashioned shrub has prolific, fragrant blooms in the spring, followed by deep green foliage through the summer. The plant is slow-growing, but can reach heights of 20 feet and is hardy to U.S. Department of Agriculture (USDA) plant hardiness zone 3. Shrub lilacs typically reach 10 to 12 feet high and come in lavender, purple, rose or white. These plants are ideal in groupings, as a hedge or as specimen plants in a flower bed. They grow in full sun to partial shade and require only minimal watering once established. Korean lilac (S. oblata dilatata) has small, oval leaves and pink flowers. Bush lilacs are small and compact. Ideal as foundation plantings or in small gardens, bush lilacs include cut-leaf lilac (S. laciniata) and littleleaf lilac (S. microphylla). Meyer lilac (S. meyeri) is another bush lilac that produces deep purple flowers. When choosing lilacs, grow plants based on the size of your garden and your preferences. Adventurous gardeners might try growing several different varieties to extend the blooming season. For example, late lilac (S. villosa) and Japanese tree lilac bloom in mid-June, several weeks after most lilacs have finished flowering. Lilacs prefer a light, well-drained soil, although they will grow almost anywhere. They are fairly drought tolerant once they are established. Lilacs are prone to powdery mildew, especially in humid climates. This disease causes a white powder to grow on leaves mid-summer. It is generally harmless, though unattractive. Borers and scale can be controlled with dormant oil sprays. What Months Are Lilacs in Bloom?